What are the 5 best video converter apps for Android? With rising technology, we want everything on our phone. No one has the time to open their PC and wait until it responses and then find a software then delete that software and find a free one. After wasting a few hours, congratulations you get a low-quality video or audio which reminds you of the 1990s. I can understand the feeling because I have been there. After testing many apps on my phone, I have concluded the top 5 best video converter apps for Android available to install for free in 2019. The article will focus on features including speed, types, quality, freedom, and much more. Don’t worry, because this is your final place in finding the best video converter app for Android. The app is excellent, and I have already recommended this app on my article how to fix unsupported audio-video codec issues. It has a simple interface, and it asks for a few details including video quality and the format. The app works in the background which means you don’t need to sit and watch it converting. After installing, you will need to allow the app to see your files. Once that’s done let’s see what the app has to offer. You can convert AVI, MP4, FLV, MPEG-1,2, MOV, WMV, MKV, VOB, 3GP, SWF, MP3, AAC and few more to any of the mentioned formats. 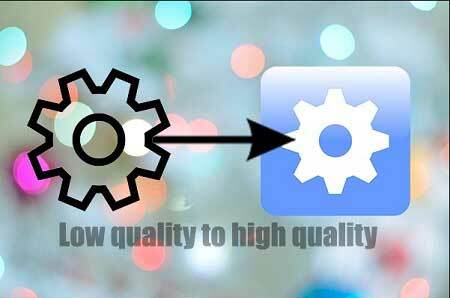 You can convert the video to high-quality audio. Merge and join videos. Add multiple video files and make them one video. Cut and trim a video. Add slow motion effect to videos (free and premium). Reverse a video (free and premium). How does Video Converter work? After opening, tap on an option and then select a video. The second screen shows you the video with details. The third screen asks for the type you want. You can convert into formats supported by Android, iOS, Windows and BlackBerry. Other extensions include MP4, 3GP, MKV etc. After selecting the one, you have an opportunity to confirm the video-audio details. It will take some time depending on your video, and your converted video-audio is ready. What else can you do with Video Converter? You can change the theme, video file directory and audio files directory in the settings menu. The left panel contains more options including Rate Us, PRO, feedback etc. Before we move on, a premium version of the app is also available which lets you convert more efficiently and allows you to select videos with any length. 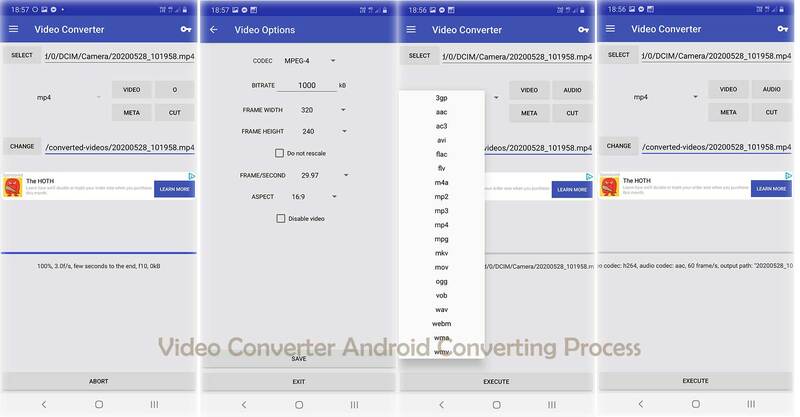 With a vast number of features come for free, Video converter is one of the best video converter apps for Android in 2019. Try the app here. Check out: Top 10 must-have Android apps. A simple free converter is available to install right now. The app is developed by aKingi org. The app does not ask too many questions. You can select the video you want and convert into formats including MP4, MP3, AC3, FLV, AVI, M4A, MP2, MPG, MOV, VOB, WAV, WEBM, WMA and WMV for free. Meanwhile, you can also convert the video into FLAC, MKV and OGG after purchasing the premium key. You can also configure video and audio separately before converting. Other options include adding meta information and a premium feature cutting the video. The premium key is about $5, and it is available as a separate app on Google Play. After opening the app, you can select the video you want to convert. You can customise the video and audio settings if you wish and change the output folder. Once all done, tap on Execute button on the bottom. It will take some time depending on the video. Once all done, you can tap on Open Folder to see the converted or follow the output directory to find all the converted videos. It supports a vast number of extensions to convert for free which is the reason the app is one of the best video converter apps for Android. You can try Video Converter Android here. A simple lightweight and easy to use converter from antvplayer. It currently has over 5 million downloads and 64 thousand ratings. The default interface reminds you of Windows 98, but everything is clear to understand. The settings menu comes with options including theme, output folders, extensions and a few more. There is a button on the top to open the output folder. You can convert videos to MP4 and MP3 with one tap. It comes with an option called Expert. Tapping on that button shows a wide range of customisation options for you to try. You can select the format including MP4, OGG, 3GP, AVI, MPEG, FLV, M4A, 3GA, OGA, WAV and GIF. You can also change the output folder before converting. How does Media Converter work? After opening you’ll see all the folders available. Locate the video, and the next screen showing three buttons will come up. Tap on Expert if you want to play with the app. In the expert mode, you have options to select the extensions, trim the video, crop the screen ratio, change the audio-video quality and change the video resolution. Once you have finished, tap on Convert button and see one of the best video converter apps doing the magic. Try the app here. 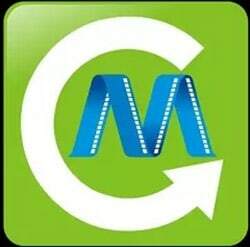 Developed by VideoShow EnjoyMobi Video Editor & Video Maker Inc. VidConnect is a different level converter. The app lets you convert videos to MP4 and MP3. You can also trim and compress a video or multiple videos if you want. Using the app is straightforward, and it converts the videos faster than other converters. Another good feature of VidConnect is it lets you enjoy the premium for free. 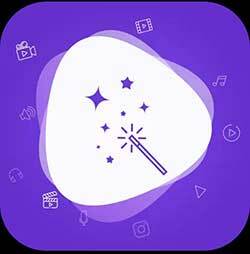 You will have to install an app suggested by VidConnect, and you can enjoy the app with functionalities including no ads, 4K video compression and support extra many other formats to convert videos to MP4. Converting the video to MP3 is also available below the MP4 option. After opening the app, you can see all the available options. Tap on the conversion type, and the next screen is for selecting the video you want to convert. A list with the video will come up. If you can’t find the video, then you can tap on the top right corner button to open all the files. The next screen will show you the details of the video where you can trim the video and change the resolution if you want. Tap on the button on the top to convert the video. 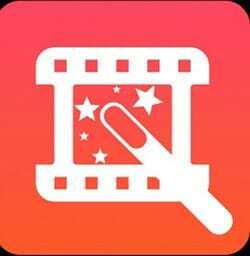 The app is one of the best video converter apps for Android because it is easy to use and you can get the premium version ($5) for free. See the app here. Video Converter supports extensions including FLV, MP4, MPEG1,2, MKV, MOV, MWV, AVI, 3GP, VOB, AAC, MP3, WAV and a few more. Add slow motion effect to the video. The free one only supports 10 seconds. You can add a video and select the part you want in slow motion. Join and merge the videos. Reverse a video (10-sec rule). Extract audio from the video. The app is one of the best video converter apps available to download in 2019 because it comes with a wide range of options and easy to understand interface. After opening you have the options to select. To convert a video tap on the Convert button. All the saved videos will come up. You can tap on Browse to see the storage. files Once you have selected a video, the next screen will show you the details. Tap on Next and the extensions screen will display. Find the format you want and tap on Next. Finally, select the video and audio and quality and start converting. Once converted you can find the video in the output folder or My Studio in the left panel. Try the app here. It can be frustrating when you want the video in the format you wish to and the apps keep asking you to pay. With hundreds of video converter apps, it’s hard to pick the right one. Anyway, I hope the article helped you find the perfect video converter for your phone. Let me know your experience with any video converters you have used. Leave a comment so we can discuss more. Image information: The images used are the official icon for the apps. An icon is the property of the owner/developer. None of the photos belongs to me. None of the apps is promoted for my benefit. Last edited: 03/04/2019.